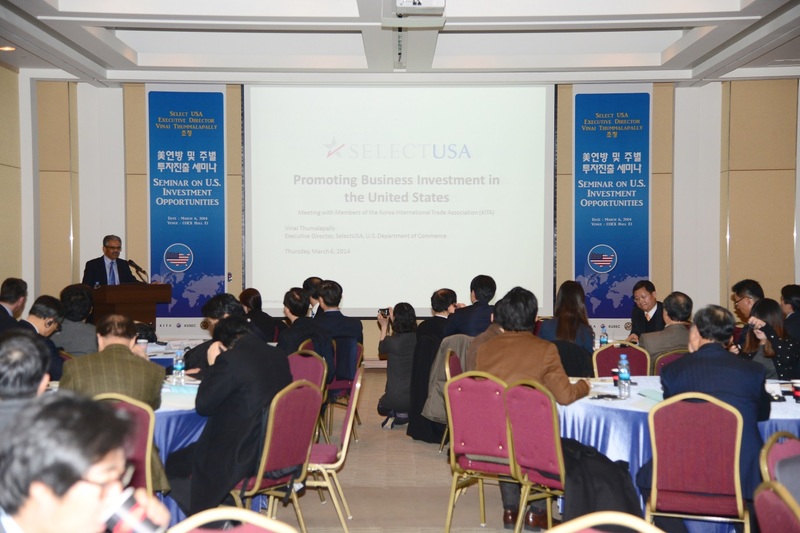 SelectUSA Director Vinai Thummalapally speaks to investors in Korea about services available through the SelectUSA program. Vinai Thummalapally is the Executive Director of the SelectUSA Program. South Korea is currently the 16th largest and 14th fastest-growing source of investment in the United States. That investment has grown rapidly – at a compound annual growth rate of 14.9 percent from 2008 to 2012. The U.S. subsidiaries of Korean companies directly employ more than 32,000 people in the United States, contributing almost $60 billion to the U.S. economy. These firms export almost $9.7 billion worth of goods from the United States. Those are great numbers, and we want to see them continue to grow. To that end, I am excited to announce that our Commercial Service team in Seoul, Korea is hosting a Road Show event on Friday, May 16 – the week before an already announced Japan Road Show. The events will provide an opportunity for U.S. economic development organizations to connect with Korean companies interested in investing or increasing their investment in the United States. I recently returned from a trip to Seoul, Korea, where I had the pleasure of meeting with our team at the U.S. Embassy, our partners in the Government of the Republic of Korea, and investors who are interested in setting up shop in the United States. Together we traveled to different companies in Korea to get feedback and talk about their experiences working with the U.S. I also enjoyed sitting down with investors and trade associations to talk about SelectUSA and its services for helping companies expand investment in the U.S. These conversations help inform programming so that participants get the most out of events like the upcoming road shows. While in Seoul, I joined U.S. Ambassador Sung Kim and Senior Commercial Service Officer Jim Sullivan to welcome officials from Hankook Tires and congratulate them on their announcement of the firm’s first U.S. manufacturing facility in Clarksville, Tennessee. The company is investing more than $800 million in the new plant, which is expected to create approximately 1,800 full-time jobs. We also met with Samsung to learn more about its significant investments in the United States, including its recently announced project to build a new Silicon Valley R&D Center in Mountain View, California. Another stop included the Korea International Trade Association (KITA), which represents more than 71,000 companies. We had the opportunity to talk with some of their members about President Obama’s expansion of SelectUSA, including investor visas and how our interagency team at the U.S. Embassy in Seoul – which includes staff from the U.S. Departments of State and Agriculture – can help them invest in the U.S.
We look forward to working with the states, cities, and regional organizations who take advantage of the opportunities at the upcoming Road Show in Korea.